We would like to thank all of you for awesome support and everyone who gave us the highest rated apps on iTunes! + IMPROVED: Racing simulation & fix randomization problems. + IMPROVED: Multitasking support for iOS4! + IMPROVED: "More Apps" page. 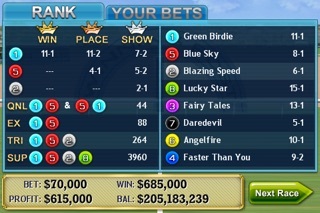 Thanks for playing Virtual Horse Racing 3D!!! To celebrate New Year 2011, please enjoy our BIG SALE games and applications for a limited time! Tell you friends and enjoy! + Full support for iOS4. + High definition graphics for Retina display (iPhone 4). + Multitasking support for iOS4. 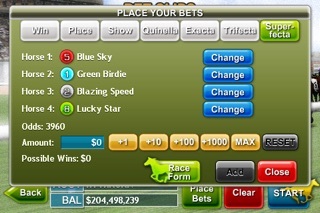 + Added: "Box" option for Exacta, Trifecta, & Superfecta. + Improved: Fine tune racing simulation to make it realistic and little harder. + Fixed: Minor issues, jockeys weight, lower the odds, and typos. Featured on iTunes App Store. 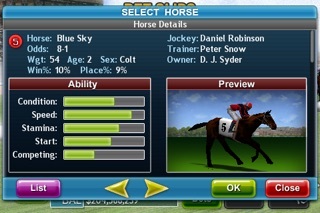 Virtual Horse Racing 3D is the most realistic 3D horse racing game on iPhone and iPod Touch. It's easy, exciting, fun, and highly addictive. Challenge yourself and see how much can you win! + Exotic Bets: Exacta, Quinella, Trifecta, and Superfecta. + 3 saved game profiles. + Betting history (last 10) and records. + Racing history (last 10). + Rank results and improve bet results. + Resume game state in case app shutdown. + Support iPhone OS 3.0 or higher. 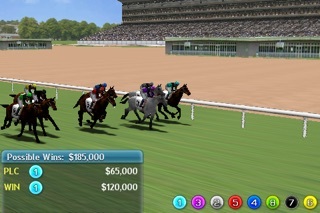 Virtual Horse Racing 3D (v1.1) is the most realistic 3D horse racing game on iPhone and iPod Touch. It's easy, exciting, fun, and highly addictive. Challenge yourself and see how much can you win! 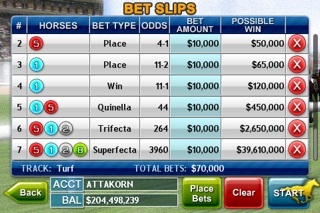 - Exotic Bets: Exacta, Quinella, Trifecta, and Superfecta. - 3 saved game profiles. - Betting history (last 10) and records. - Racing history (last 10). - Rank results and improve bet results. - Resume game state in case app shutdown.